Digital Frontiers: How are artists using digital platforms and technology to tell a diverse range of stories, enable and adapt the creative process? How does digital change the nature of collaboration, form and our engagement with audiences? Steve Mayhew talks to James Evans, Duncan Graham and Angharad Wynne-Jones about the programs and platforms that are changing what and how we make. Artist Conversation – Adrienne Truscott: Adena Jacobs talks to choreographer, acrobat, writer and comedian Adrienne Truscott, amid her busy Sydney Festival schedule performing her solo show Asking For It, and as part of burlesque duo The Wau Wau Sisters. Respect Your Elders: Claudia Chidiac kicks of the first in her series of discussions with female theatrical elders, joining director, writer and dramaturg Sue Rider. Writing Room #2 – Playwrights Writing Space: The second in the Writing Rooms series hosted by PWA Director Tim Roseman will focus on spatial issues in theatre writing, featuring guest playwrights Angela Betzien, John Romeril and the visiting Swedish playwright and dramaturg Ninna Tersman. What’s Gone Wrong With Theatre For Young People in Australia? Australia’s TYP sector has found great success touring in America’s conservative marketplace, with limited interest from Asia and almost none from Europe, where the common perception is that our work is obvious, condescending, old fashioned and too careful. Are they right? Is theatre for young people in Australia in the midst of a crisis? Are we not making experimental, political work because we’re stuck in a ghetto? Simon Abrahams asks Thom Browning, Finegan Kruckemeyer and Lenine Bourke about their work, the secrets to success, how our sector compares internationally, and if we care what a bunch of Europeans think anyway. Who Owns the Story? Alicia Talbot hosts a formidable group of theatre makers, discussing the complexity surrounding ownership and ethics in storytelling. Alicia is joined by actor and director Isaac Drandich, Griffin’s Lee Lewis, verbatim theatre maker Roslyn Oades and Malthouse Theatre Artistic Director Marion Potts. Company in Conversation – Back to Back Theatre: David Williams talks to Back to back Theatre Artistic Director Bruce Gladwin, Executive Producer Alice Nash and ensemble member Scott Price. Respect Your Elders – Jennifer Compton: Claudia Chidiac talks to poet and playwright Jennifer Compton, whose first work Crossfire premiered at the Nimrod Theatre in 1975. Shaping Story – How Dramaturgs Make It: In another of our series of discussions with theatre creatives about their craft, Dr Paul Dwyer speaks with Tom Healey, Mark Pritchard and Ninna Tersman about the dark art of dramaturgy. Sustaining Careers – Regional and Isolated Art Makers: Robert Jarman and Angela O’Donnell host a discussion drawn from career experience and a Churchill Fellowship. Walkie Talkie – Redfern Then and Now: Aunty Donna Ingram will take you to the heart of Aboriginal Redfern, starting with a yarn at The Block and a short walk to see some local landmarks and discuss the neighbourhood’s social, cultural and political history. Spaces are limited, so bookings can be made at the Information Desk on the day. Walking groups will depart from the Courtyard at 2.15pm. Bring a hat and water, we’ll provide the sunscreen. 2.45pm – 4.00pm: ADVENTURE SERIES! Readings & Discussion: Plays for Australia and Tiny Plays for Ireland Radical compliance?… or a response to a call to arms? The Play For Australia project by independent company Vessel is both. Based on catalyst project Tiny Plays for Ireland…Fishamble Theatre , Ireland AD Jim Culleton directs actors from Rocksurfers Theatre in readings of 3 Tiny Plays for Ireland and 4 Plays for Australia written by Ross Mueller, Chi Vu, James Lawson and Candy Bowers. Interspersed with discussion facilitated by Tahni Froudist – Hothouse Theatre. “Independence” Within an “Industry”: Dan Koop hosts an open discussion about when being independent can be both an advantage and a challenge within an industry of comparatively well-resourced organisations. Rather than discussing any perceived Indie vs Org dichotomy, let’s envision a sector where time and resource-poor independents can work effectively with, and be supported by, more permanent organisations. Respect Your Elders – Liz Jones: Claudia Chidiac concludes her conversation series with the godmother of independent theatre in Melbourne and artistic director of La Mama Theatre since 1976, Liz Jones. Merrigong Theatre Company & The Disability Trust: Chris Bendall talks to Merrigong’s Anne-Louise Rentell and The Disability Trust’s Amy Carroll about their collaboration on the Altogether Drama Program. Practice Lab – Ghosts: Join Anna Tregloan in the studio to experience and hear her talk about her ever-evolving, continual public creative development, The Ghost Project. This project breaks into small shards of video, installation, lecture and discussion that have so far shown in Seoul, Bilpin in the Blue Mountains, and The Rocks and Campbelltown in Sydney, along with developments in Hong Kong and Indonesia. Part documentary and part story exchange, it responds to and reflects the contemporary relationship to ghosts and haunting. 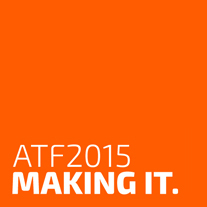 The Practice Lab series at ATF is supported by Arts Centre Melbourne Asian Performing Arts Program. Delegates will walk to Carriageworks, departing from the Seymour Centre Courtyard at 2.45pm. How is the ground shifting for collaborations between big and small companies, and independent artists? What will the landscape look like in 10 years? Circa’s Kate Fell hosts a discussion with Circus Oz Artistic Director Mike Finch, POST’s Mish Grigor, Steamworks writer and director Sally Richardson, and Melbourne Theatre Company Producer Martina Murray. Meet inaugural TNN Director Jane Kreis and local arts workers for a well-earned Day 3 drink in the Everest Theatre Foyer. Aunty Donna Ingram will take you to the heart of Aboriginal Redfern, starting with a yarn at The Block and a short walk to see some local landmarks and discuss the neighbourhood’s social, cultural and political history. Spaces are limited, so bookings can be made at the Information Desk on the day. Walking groups will depart from the Courtyard at 5.30pm. Bring a hat and water, we’ll provide the sunscreen. Catch up with friends, meet new ones, discuss and debate the day’s goings on. And all with a bar and some light entertainment.